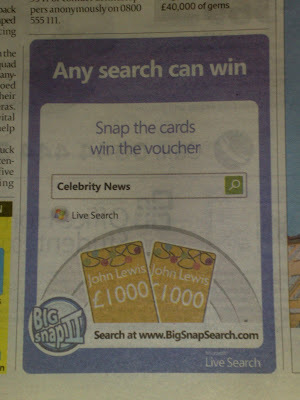 Hosted at www.bigsnapsearch.com, every search made produces a pair of snap cards on the page header - if they match, the searcher wins John Lewis department store vouchers. 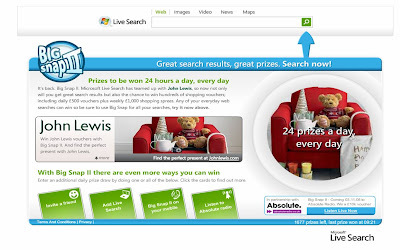 Microsoft have recently run Live Search promotional activity around the Indiana Jones film, have introduced a Cashback scheme for purchases made through Live Search and have also added Live Search to Facebook. Whilst Google pride themselves on having reached dominance through strength of product and organic growth, this latest Microsoft marketing activity is yet another example of how determined Microsoft are to grow their Search volumes - and in the current economic climate it could be an offer that consumers find enticing. 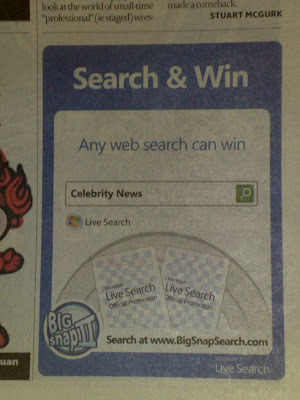 Will Cuil kill Google or is the threat elsewhere? 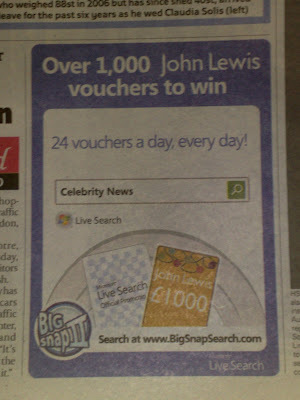 Will Google ever really know me?